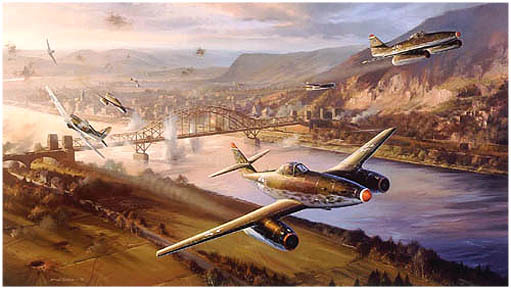 Me262 and Arado bombers attempt to destroy the Ludendorff bridge over the Rhine at Remagen, to prevent it's use by the advancing 1st. American Army. RAF Tempests pitted against the German jets attacked head on, with a closing speed approaching 1000 mph. Signed by: George Csurusky, Rony Lauer and Hermann Wieczorek.